Sheet Pan Crispy Cheddar Pork Chops are an easy to make dinner using one sheet pan. 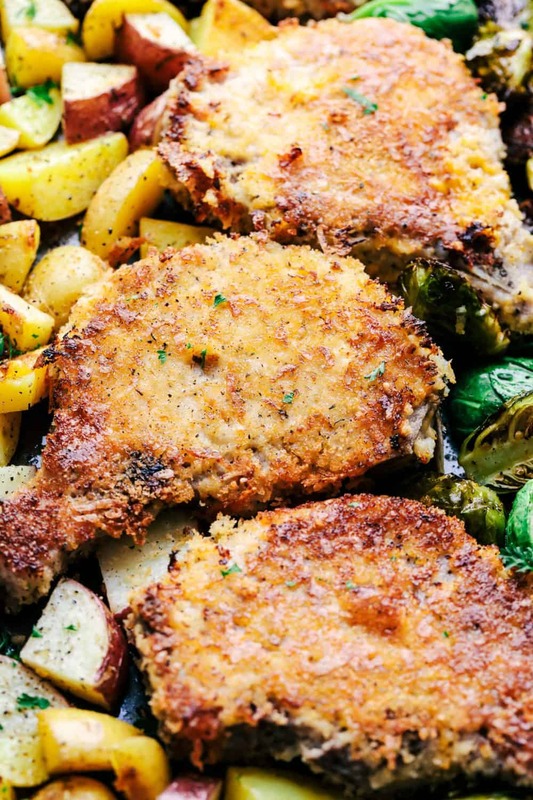 Crispy and cheesy coated pork chops cook to tender perfection with roasted potatoes and brussels sprouts. This is one unforgettable meal! This recipe has been sponsored by the National Pork Board. I love working with brands that I am passionate about and use in the kitchen for myself. All opinions expressed are my own. I am so excited that fall is officially here. The crisp, cool mornings and beautiful leaves in the mountains are my favorite part. I love getting inspired for new fall flavored dishes that are easy to cook for my family. It is time to bust out the sheet pans and casserole dishes and start baking in the oven again. 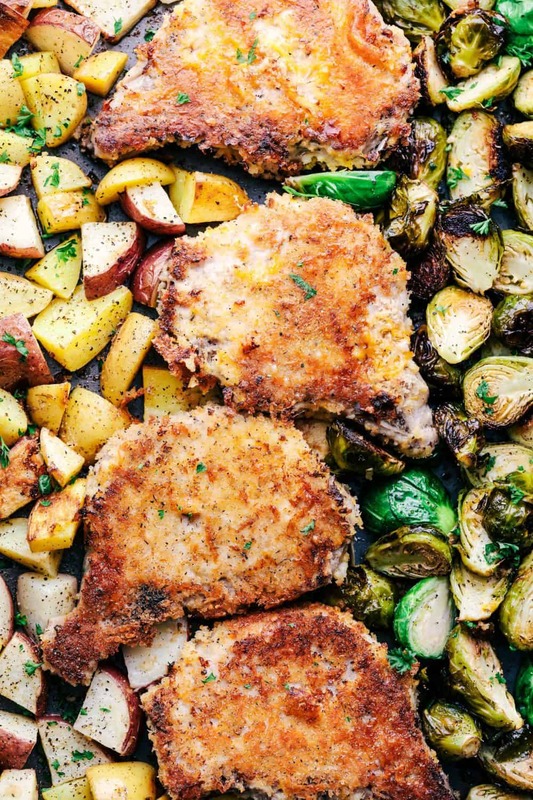 Sheet pan meals are all the craze right now. 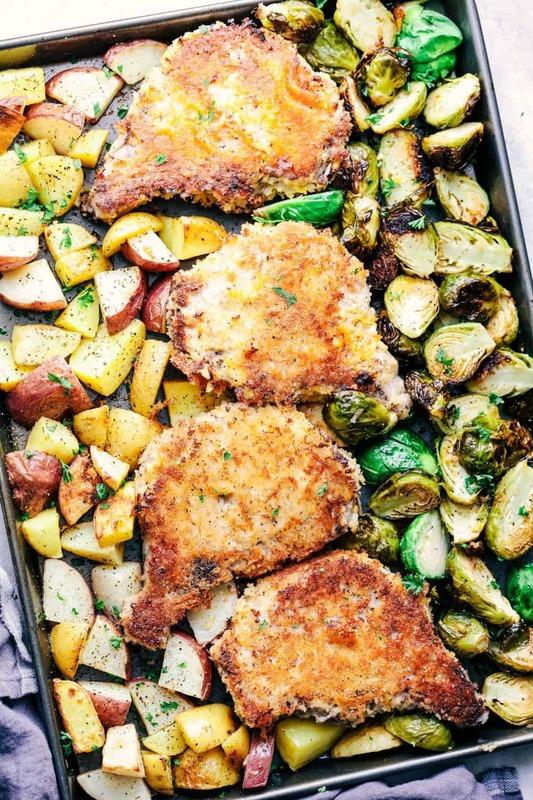 How can you go wrong with only using one sheet pan and having your entire meal cooked in one sheet? Cooks today are craving new food inspiration, creative recipes, flavorful dishes – and want it all at a great price. And that’s happening today with pork. Our family loves pork and it is affordable and such a great price for families. 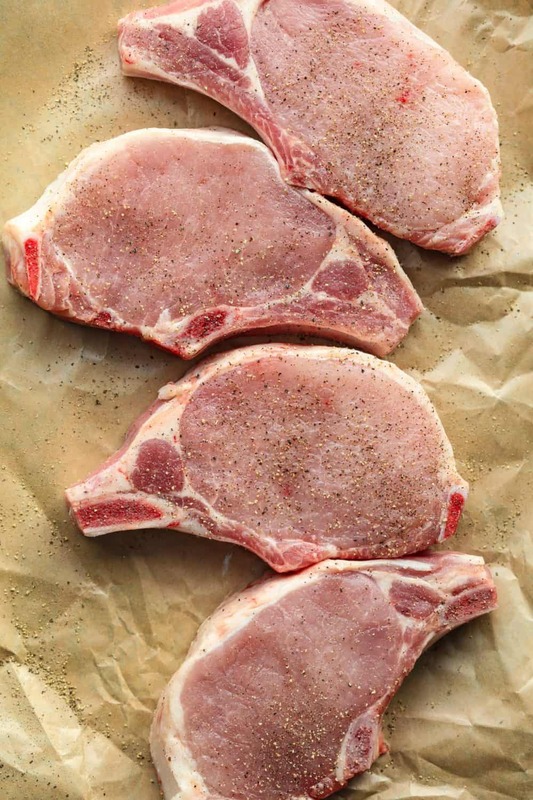 According to the National Retail Report, 2017 shows smoked pork chops averaging $4.46 a pound compared to 2016 at $4.77 a pound. It makes buying pork even easier and its no wonder that it is doubling as the requested meat in restaurants. We love it so much that we incorporate it into our meals at least once a week. I have made quite a bit of pork in my day but I am honestly here to tell you…. this was one of the best things I have ever eaten! First you start by buying high quality pork chops. I used bone- in pork chops, but boneless certainly will work. I like using a thick cut because they cook evenly alongside the potatoes and Brussels sprouts. You then make an egg and milk mixture and a panko cheddar mixture. You dredge the pork into the egg and then into the crispy panko cheddar topping. Let the pork bake for at least 20 minutes and then flip the pork over to give each side that crispy coating that we all love. minute rest. For ground pork, cook to an internal temperature of 160 degrees F.
You guys. I can not get over how uh-mazing these pork chops turned out. The crispy cheddar coating was absolute perfection and the flavor was unreal. The crispy coating also gets a blend of dried spices to ensure that you will have enough flavor with every bite. And the cheddar cheese hidden inside is my favorite part! It gets crispy as it cooks and just melts on top of the pork. With the holidays approaching pork is the perfect time to celebrate and make the center of your dinner table. This is the perfect cozy Fall meal. Those pork chops just look like crispy, delicious perfection, don’t they? The entire family is already begging to make the crispy cheese pork chops again! I know that they will be a huge hit at your dinner table as well! For more delicious pork inspiration be sure to follow The National Pork Board on Facebook, Instagram, Youtube, Twitter and Pinterest! In a shallow dish, whisk together egg and milk. In another shallow dish add panko, cheddar cheese, italian seasoning, and garlic powder. Salt and pepper the pork chops and dredge them in the egg mixture and then coat them in the panko mixture. Lay them on your sheet pan. In a large bowl add the brussels sprouts and potatoes. Salt and pepper and toss with the olive oil. Lay them next to the pork on the sheet pan. Bake for 15 minutes, then flip the pork over and continue baking for 12-15 minutes or until the pork reaches an internal temperature of 145 degrees. This is a must try. It looks delicious. I made this tonight and even my picky boyfriend liked it! I agree with a previous comment that there was a lot of panko mixture left over. Unfortunately, I forgot to get Brussel sprouts. The pork chops didn’t come out very crispy, but that could be from the olive oil on the potatoes. I forgot to lessen the amount of olive oil since I didn’t have Brussel sprouts. And I used less potatoes. The breading on the pork chops was very flavorful. I substituted parmesan cheese for the cheddar cheese. Everything was very good! I love all your recipes. They are easy to follow come out the way you say! Looks very delicious can’t wait to try it. I’ve treid those Crispy Cheddar Pork Chops in one of the Paris restaurant, it was delicious. Your recipes are just what I have been looking for! I don’t want to say “simple cooking” but too many ingredients overwhelms flavors & overwhelms me….lol….. These recipes are fantastic! So glad I found you. Keep up the good work! wow, really nice flavors! 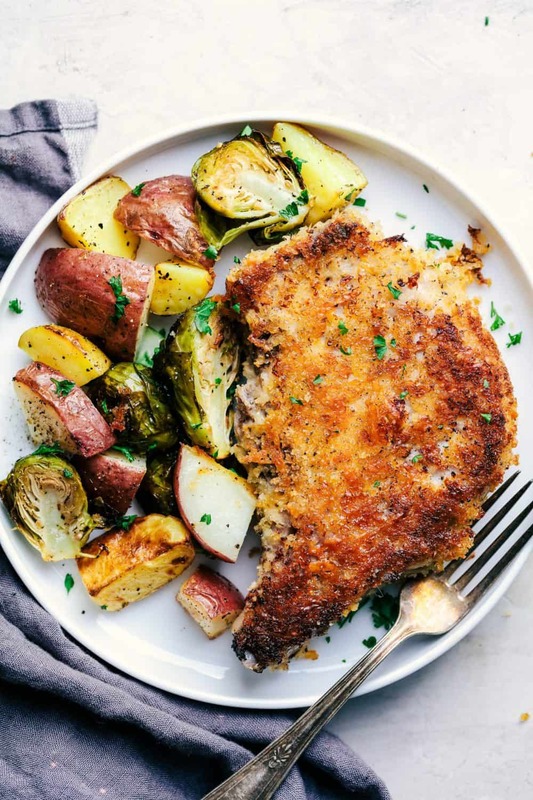 I love great pork chop recipes, and cheddar cheese, had never seen them paired before (love how they’re crispy too, thank you for this recipe! I enjoyed the flavor of this recipe, but I had a hard time getting the coating to adhere to the pork, with all those big shreds of cheddar cheese in there. (Also, I wound up with TONS of extra coating, even though my pork chops were quite large. I hate to waste.) I would try this recipe again, but perhaps subbing Parmesan for the cheddar (and moderating the amount of coating). With the Italian seasonings and garlic, the parm flavor should be tasty as well. What an Amazing Recipe! Love it Thank you for gift us this delicious Receoie and Thank you National Pork Board for sponsoring! Good lord this looks good. Not tried it yet but as soon as I have time to cook again! I always love to eat this kind of crispy chops. This item you shared looks so yummy and it is one of my favorite dish!!!!! If you love these kind of dishes then you may visit my website which is full of sweet dishes also…………..
Yumm, pork! this is some lovely recipe. gonna have to try this with family. I just made the Sheet Pan Crispy Cheddar Pork Chops, but have not cooked them yet. Should the Panko and cheddar be 1 cup instead of 2 cups? I had enough to more make 10 thick pork chops. I made 4 thick chops like the recipe said (put the extra in the fridge for another meal). I made this last night and really enjoyed it! I did make a few tweaks after reading the reviews. I had 3 boneless thick cut pork chops so I cut the coating for the chops in half. I’m glad I did because I still had plenty of coating left over. I also used fine shredded cheese so it would adhere better and I dredged the chops in flour before the egg/milk step. I also sprayed the tops of the coated chops with non-stick spray. They turned out crisp on the outside and juicy on the inside. I will definitely be making this again! I just printed several of your recipes and cannot wait to try them… however, when I go to print them, the serving amount does not print… just wanted to let you know.. thanks much! I made this tonight. I cut the bread crumbs and cheese in half, based on the comments. I didn’t think to cut the seasoning in but it was fine so I’d keep that the same in the future. I also used asiago instead of cheddar and this was SO GOOD! Cooked 20 minutes flipped, 20 more and it was perfect. You always have the BEST recipes! I made this tonight. I halved the ingredients for the pork chop breading and I still had leftover crumb mixture event though I had 4 large pork chops. I just put it on top of the chops and pressed it in. You can’t have too much breading lol! I spritzed the brussel sprouts and potatoes with olive oil, and sprinkled with salt, pepper, and a little seasoned salt; next time I will do as instructed and mix them with oil. One note is that I did use finely shredded cheese and it adhered great. I think next time I will use less Italian seasoning and more garlic, but that is just a personal preference. Thanks for the recipe; it is one I will make again. It’s very Good delicious recipe. Surely I will try this one. Thank you so much very much for that. Thank you for getting us out of our boring dinner rut! This was out of this world delicious, inexpensive, healthy, AND everyone loved it! Seriously inspired me to do more like this!! !